The carbon epoxy composite materials are nowadays widely used due to their performances. Yet, one of their major shortcomings is represented by their reduced resistance to impacts able to induce, depending on their energy, delaminations with or without fiber breaking. The non-destructive evaluation of these materials is carried out at present by means of ultrasounds ,  or by different electromagnetic methods , . This work presents a new method for detecting the delaminations in carbon-epoxy composite materials using the eddy current holography ,  and special transducers . The studied samples consist of carbon-epoxy composite plates with a thickness of 2 mm having 16 layers of carbon fibers disposed according to the sequence [452, 02, -452, 902]S. The plates were subjected to impacts with energies of 0.75, 1.0, 2.5, 3.0 and 4.0J. The eddy current control was performed by means of an absolute send-receive transducer with orthogonal coil  according to Figure1. The emission coil (3) is placed inside of a H30 FERRINOX ferrite pot (1), has 75 turns and is parallel to the inspected surface. 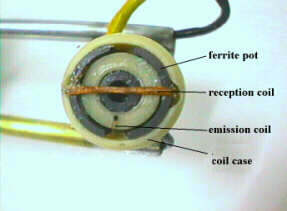 The reception coil (2) has also 75 turns and is placed perpendicularly to the emission coil. The transducer is connected to the SFT 6000N-control equipment produced by SOFRATEST, France. The transducer is scanning a rectangular synthetic aperture; a displacement robot being used for this, the positioning accuracy being 2.5mm. The lift-off was kept at 0.1mm all along the measurements. The installation output signal is quantified on 12 bits, the sampling step being 1mm on both directions. Making an adequate phase adjustment the noises were projected mainly on one of the measuring channels, the useful information being obtained on other channel. The signals were stored and holographically post-processed using Matlab 5.3. The transducer's emission coil supplied by an alternating current creates inside the examined material an electromagnetic field whose wave front becomes, starting from a certain distance, quasi-spherical. The center of the spherical wave front represent the "virtual focal point" of the transducer, placed at a distance f0 from the surface of the material under test according to Figure2. Based on this principle the real field source is replaced by a point-like source located at the distance f0. When a volumetric non-homogeneity is present, a scattered field appears resulting in the generation of an induced electromagnetic voltage u(x,y,z) at the reception coil terminals. The hologram is generated by recording the response u of the eddy current transducer which scans over a rectangular aperture in xy plane at z = f0, when the non-homogeneity is placed at a distance p from the inspected surface. In order to visualize the recorded hologram, this has to propagate backward to the source, i.e. to the non-homogeneity to be imaged. Let V(u,v,f0) be the 2D Fourier transform of the signal U(x,y,f0) delivered by the control equipment. and represents the wavelength w is the angular frequency, m0= 4p10-7H/m, s is the transversal conductivity of the composite material (s»102S/m) and m=1,2,31/4 is a natural number representing the phase multiplication constant. The measurements have been carried out at the frequencies 100kHz, 200kHz, 400kHz and 600kHz. The transducer focal distance has been calculated for each frequency apart, using the finite element method. We present in figure 3a the signal delivered by the installation when scanning over an aperture of 40x40mm on inspected surface, at a lift-off of 0.1mm, the impact energy being 2J and the frequency 400kHz. In figure 3b the hologram of the impact zones is presented for a phase multiplicity m=16 and in figure 4 the location of delamination into the depth of material for impact energies of 2.5J and 3.0J is plotted. For impact energies lower than 2.5J the impacted zones could not be detected starting from measurements on the impacted surface, these being rendered evident on the opposite surface for energy of 1J. For impacts with energies of 0.75J no delamination has been noticed. There is a linear dependence between the impact energy and the area of delamination rendered evident by hologram presented in figure 5. The same dependence has been noticed between the depths of delamination location and the impact energy. The eddy current holographic method and the utilized transducer permit to render evident the delaminations even without fiber breaking starting from impact energy exceeding 2.5J. The method permits the visualization of the delaminated area and its locations into the depth of the material. This method presents the advantage of a relatively big control speed and simple algorithm for signal processing. The authors wish to thank once again to Professor D.Balageas from ONERA - France for the profitable discussions and for the composite material samples set at their disposal. Nadia Madaoui, Adriana Savin, D. Prémel, O. Venard, R. Grimberg, An Approach for Quantitative Nondestructive Evaluation of the Discontinuities in Flat Conductive Materials Using Eddy Currents, 5th International Workshop on Electromagnetic Nondestructive Evaluation, Iowa USA, Aug.1999, 90. R.Grimberg, R.Plavanescu, A.Andreescu, Adriana Savin , Transducer for eddy current surface control,Romanian Patent no. 9960/1989 .